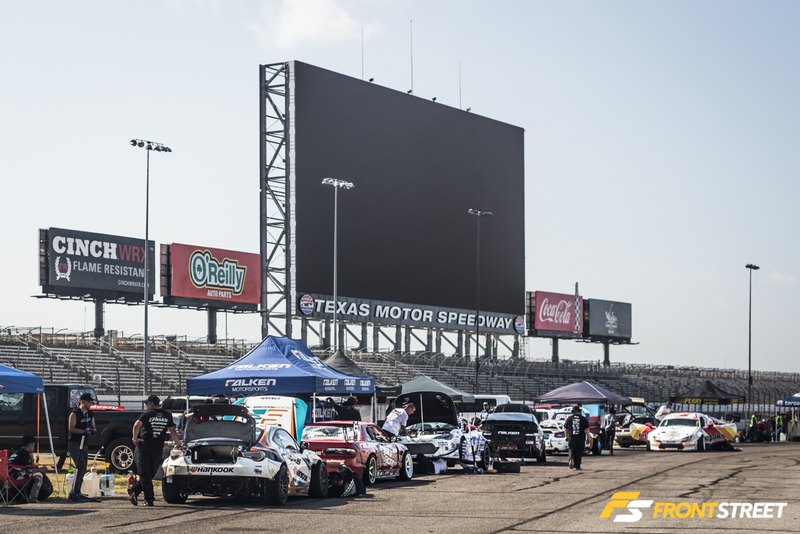 During Friday practice, teams were eager to get out onto the new course layout that made use of the infield of Texas Motor Speedway. 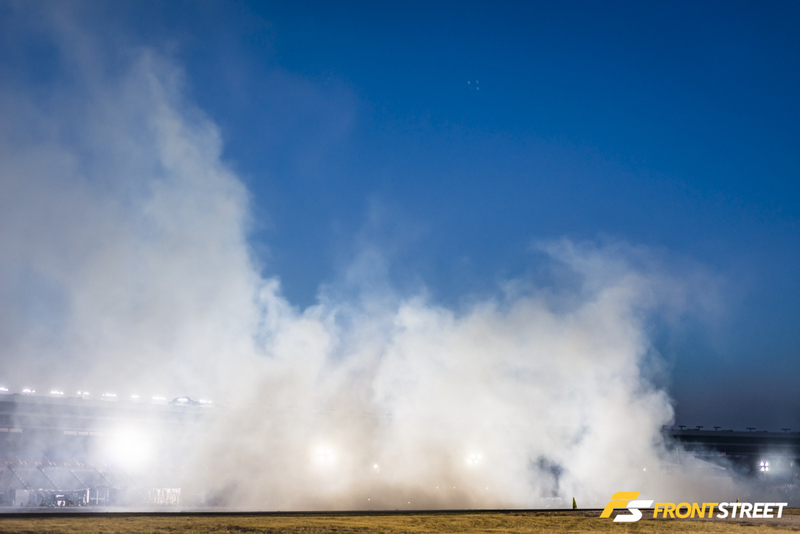 The track was run in reverse configuration this year. 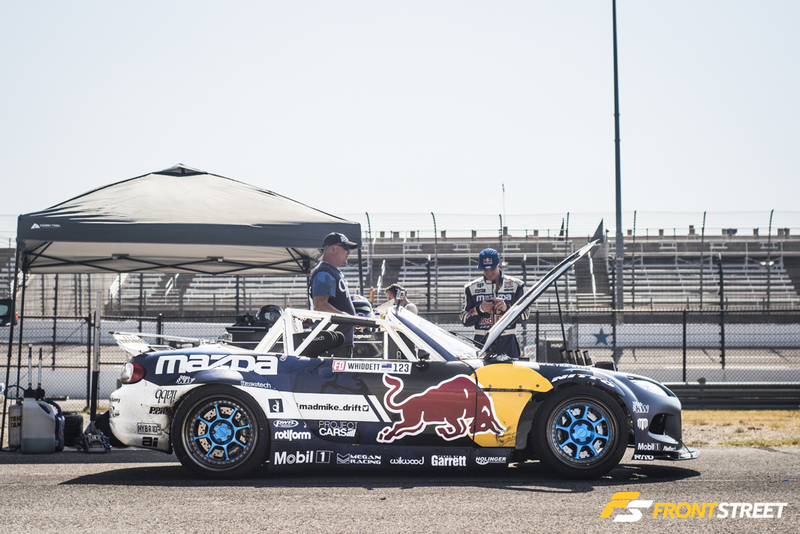 By virtue of this revision, the track posed greater challenges for drivers than in years past. 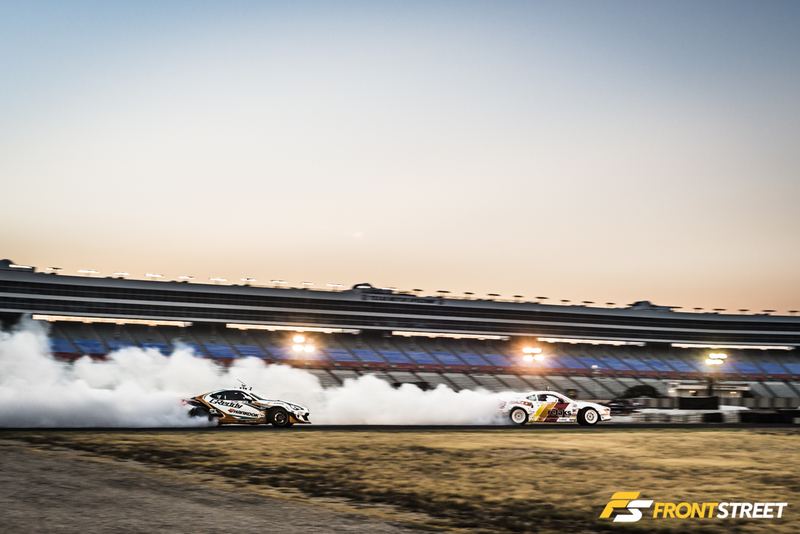 To work on their lead/follow strategy, the teams began the weekend practicing tandem runs with competitors. 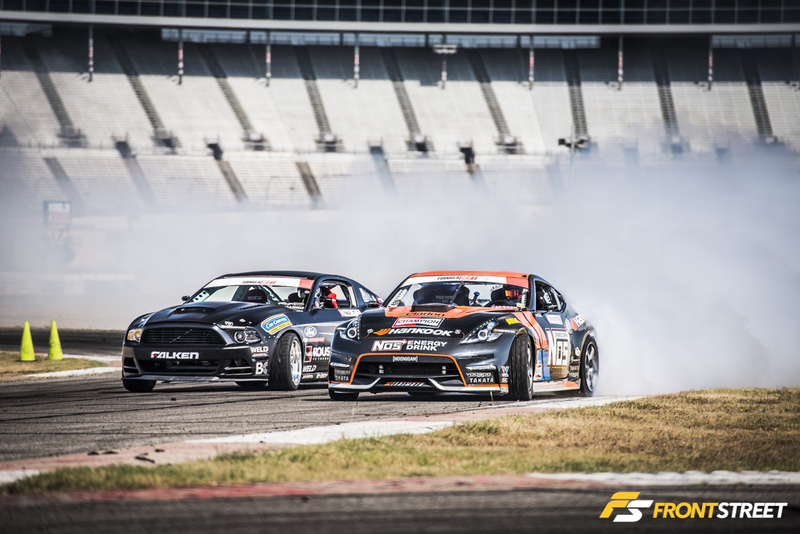 Michael Essa in the SLP Performance Chevy Camaro squared off against Texas-native Nate Hamilton in his Enjuku Racing S13.4. 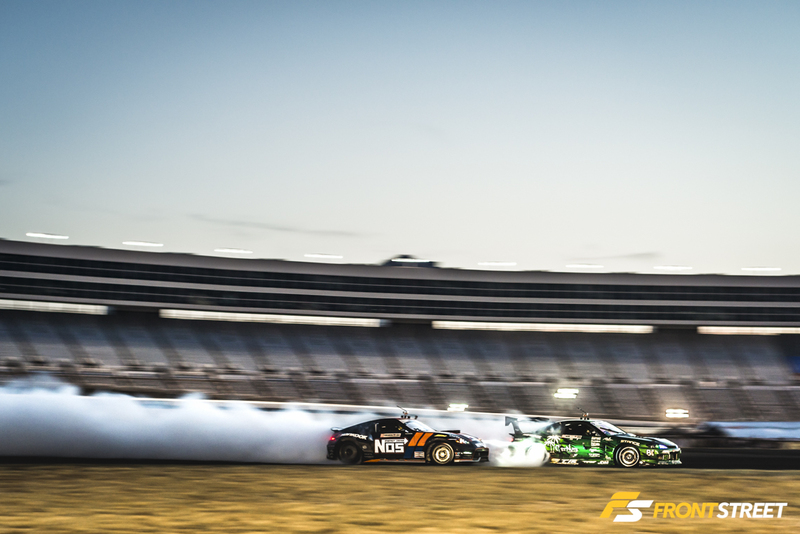 Foreshadowing competition later in the weekend, Ken Gushi in his Greddy Racing Scion FRS led a confident Daigo Saito in the Achilles Radial Nissan GTR around the fast Texas course. 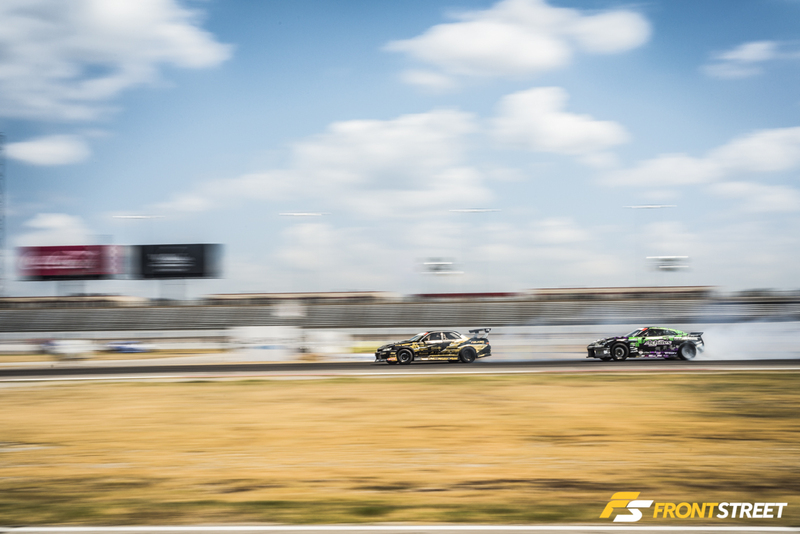 Current championship points leader Frederic Aasbø in his Rockstar Energy Scion tC and other drivers began solo practice runs as the start of Qualifying neared. 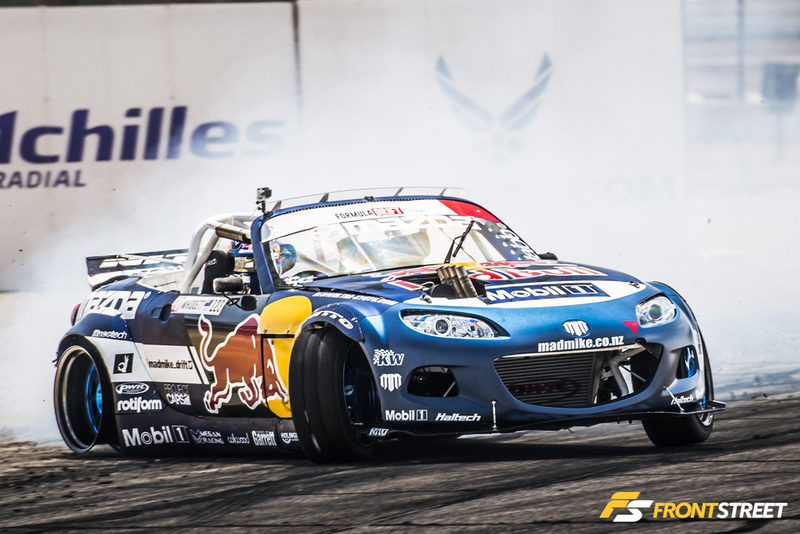 “Mad Mike” Whiddett competed in round 6 with his Red Bull “MADBUL” Miata, sometimes with only 3 tires. 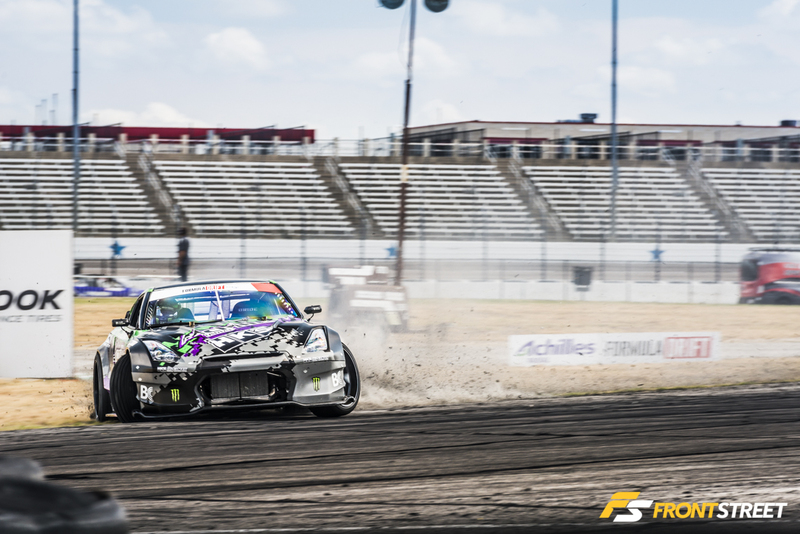 Several big names including Charles Ng in his Maxxis Tires Infiniti G37 had shaky first qualifying runs. 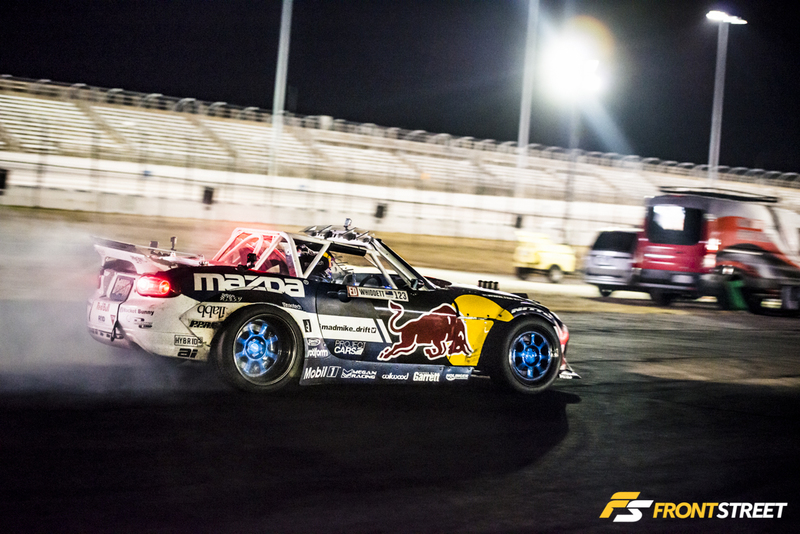 Forcing them to deliver a solid performance in their second, and final, qualifying run. 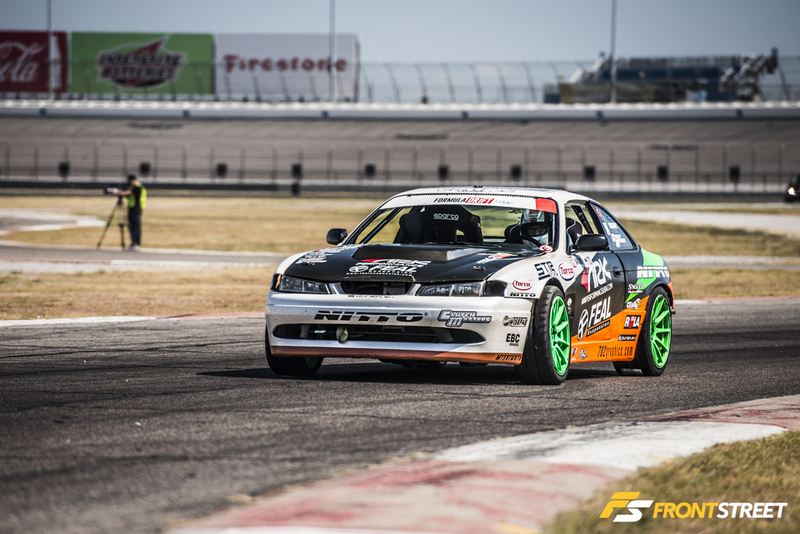 Round after round, Alec Hohnadell has earned a top qualifying spot in his Get Nuts Laboratory Nissan S14 by displaying tons of speed, angle, tire smoke, and proximity to clipping points. 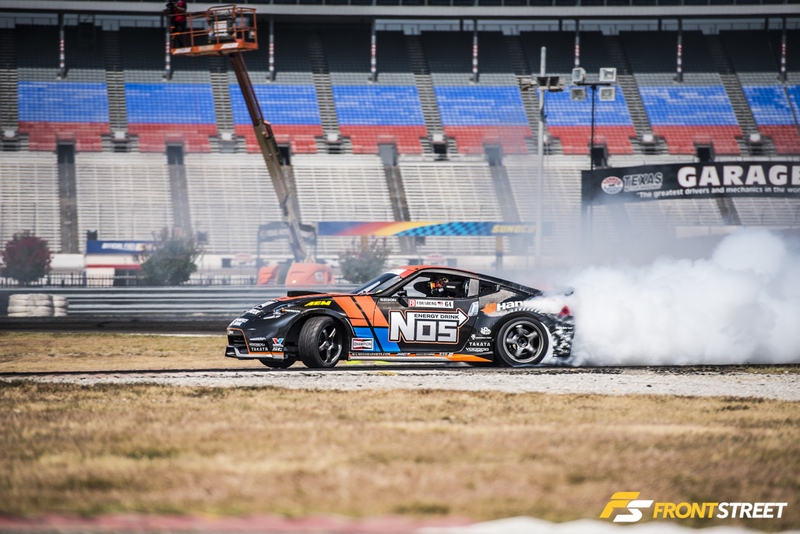 With the Top 32 qualified drivers decided, the FD Pro Championship drew to a close for the day with an autograph session. 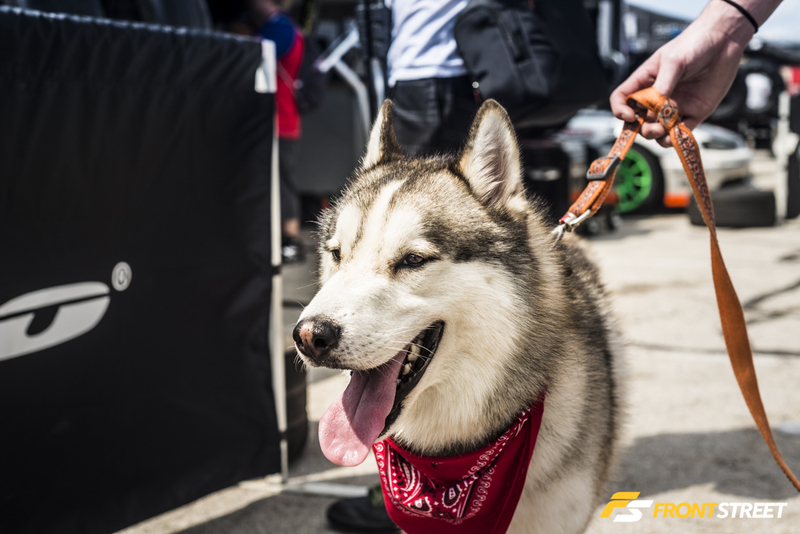 This gave fans (and their dogs) the chance to meet their favorite driver. 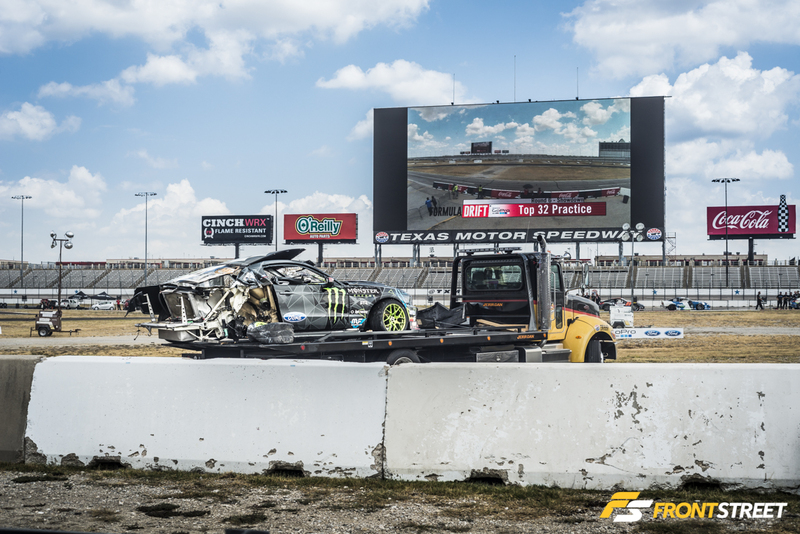 In practice the following day, more tandem and solo battles took place, as drivers tried to perfect their technique of this tricky course. 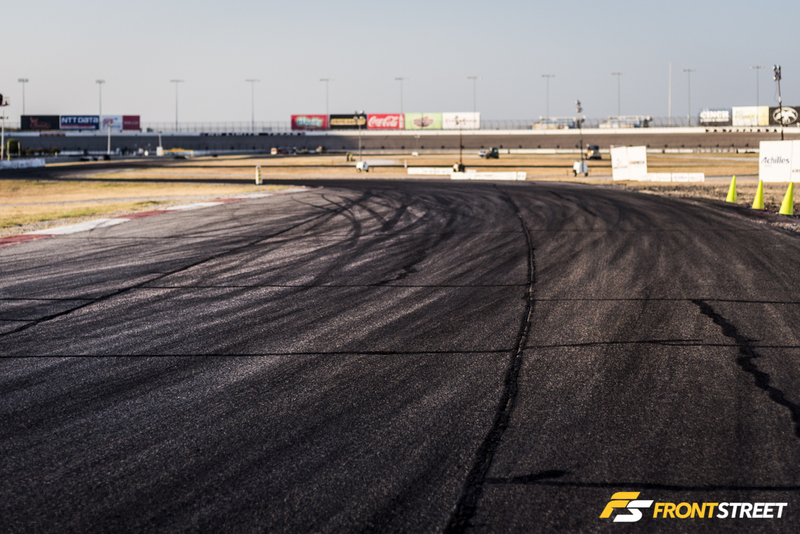 The entire track had ample run-off area except the final turn, which tested drivers by skimming the outside clipping point alongside a concrete barrier. 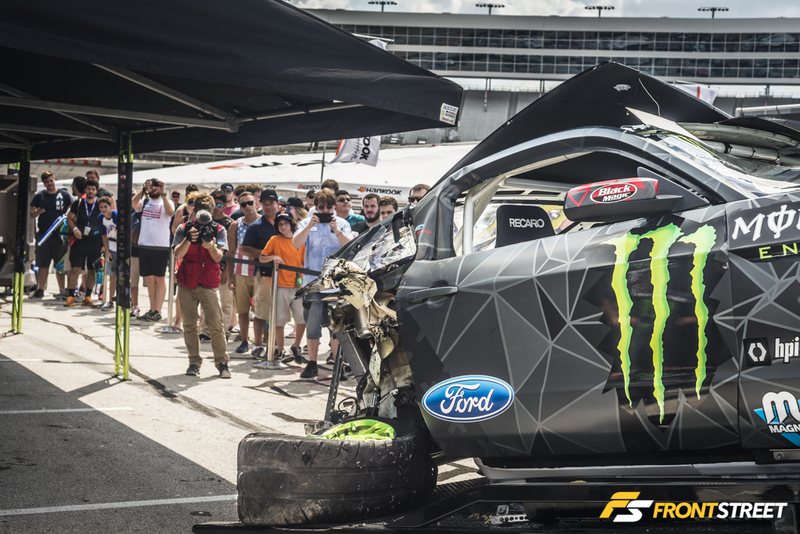 During his practice run Vaughn Gittin Jr. lost control of the Monster Energy Ford Mustang on entry of that turn. 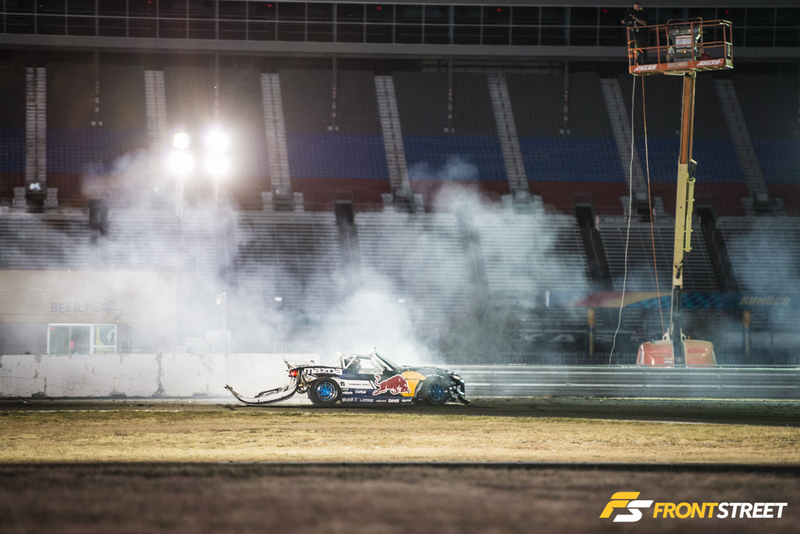 He went spinning backwards at around 70mph into the wall, turning his competition car into a large paperweight and taking him out of contention for the weekend and possibly the season. 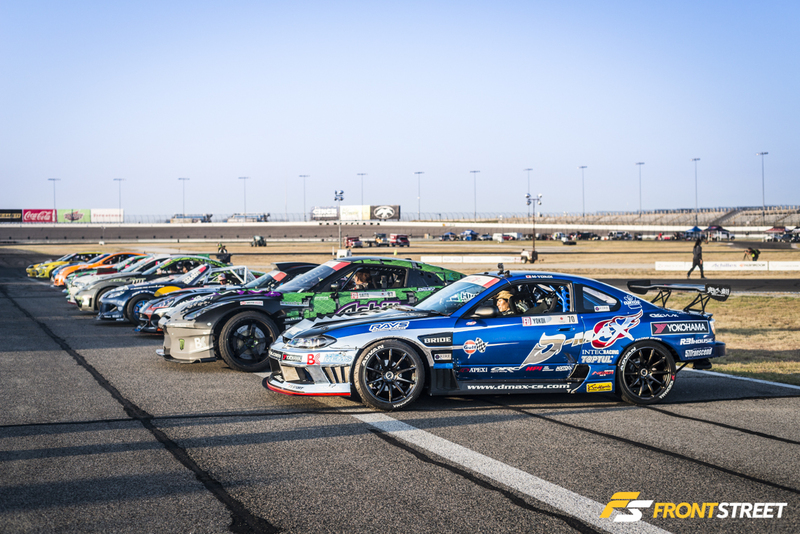 Throughout the Round of 32 eliminations, lead drivers gapped their following opponents through the high speed corners resulting in several unanimous win votes from the judges. 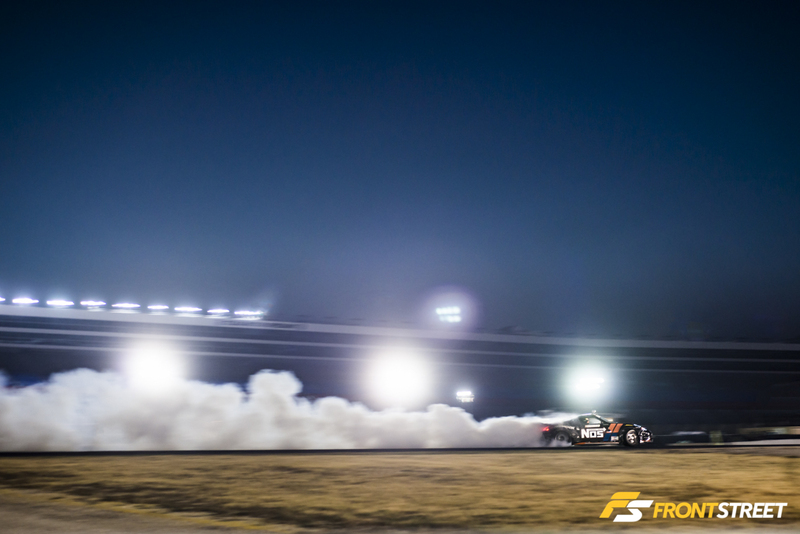 A few close battles started the tally of “One More Time” or “OMT” calls, including the run between Mats Baribeau with his Gold in the Net Toyota Mark II, and “Mad Mike” in the MADBUL. 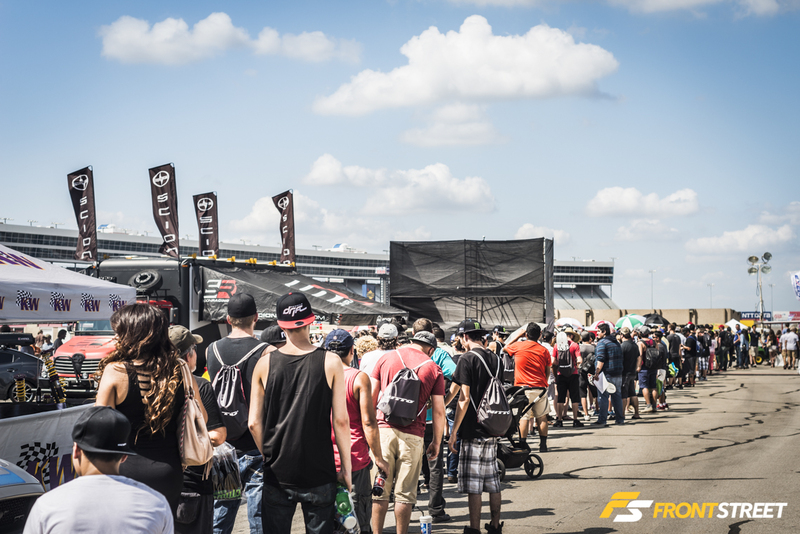 After the halftime break, the sun began to set, and the drivers lined up for their Top 16 introductions. 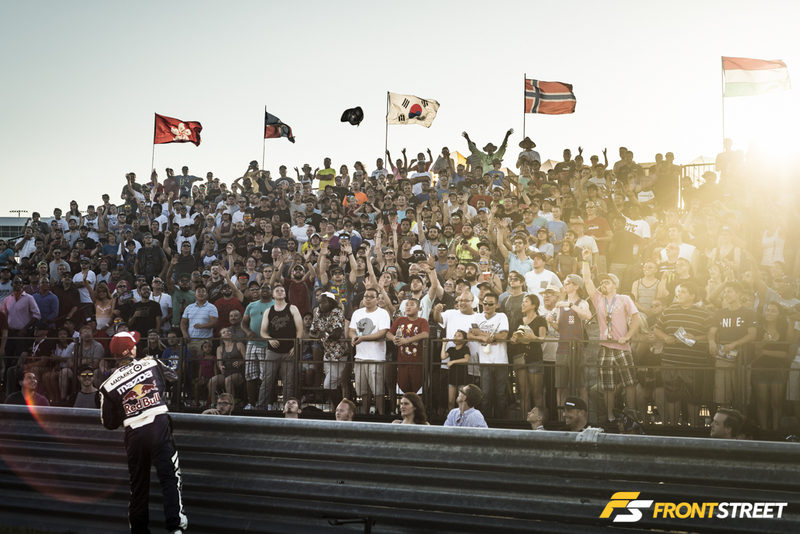 The setting sun was a welcomed change for everyone in attendance. 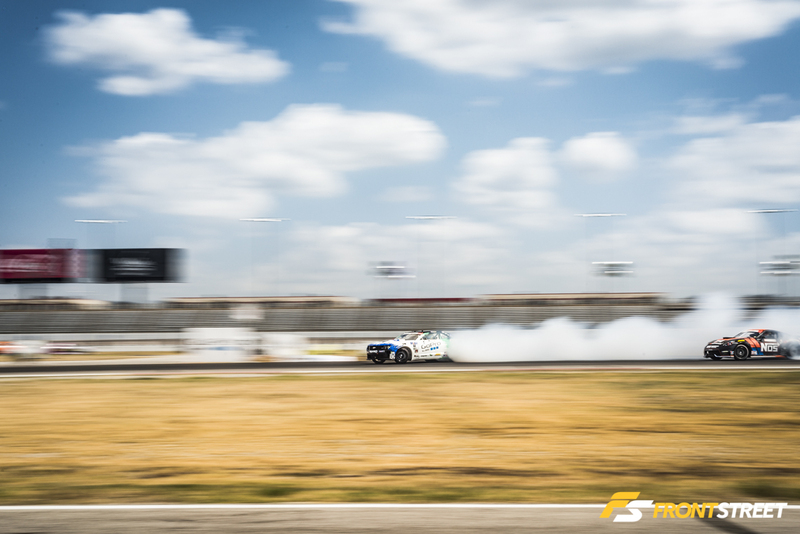 Dropping the ambient temperature down from the 102ºF recorded earlier in the day. 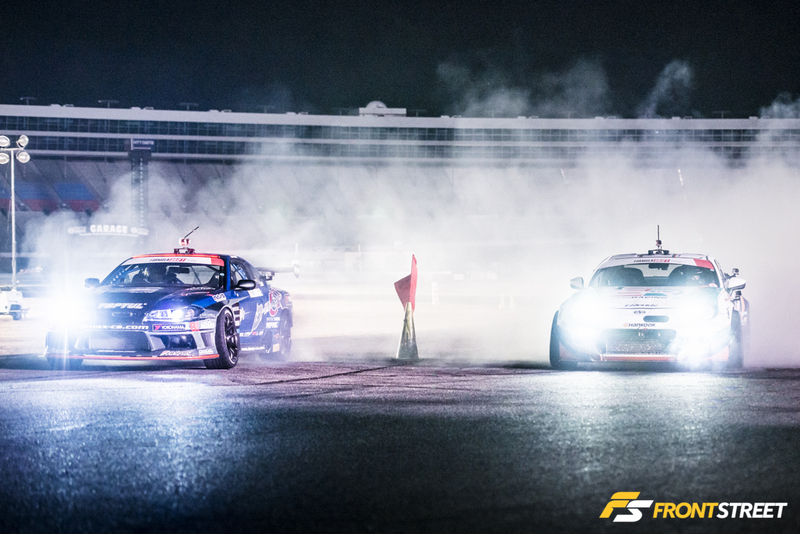 Battles continued under the bright lights of Texas Motor Speedway as darkness approached. 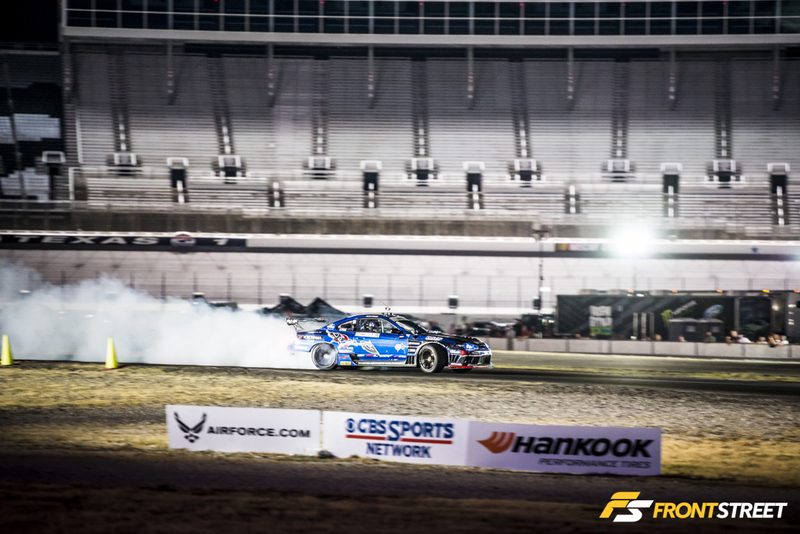 One of the tidiest runs of the night gave Dai Yoshihara in the Turn 14 Distribution Subaru BRZ, the win over Jhonnattan Castro in the E3 Nissan 370Z. 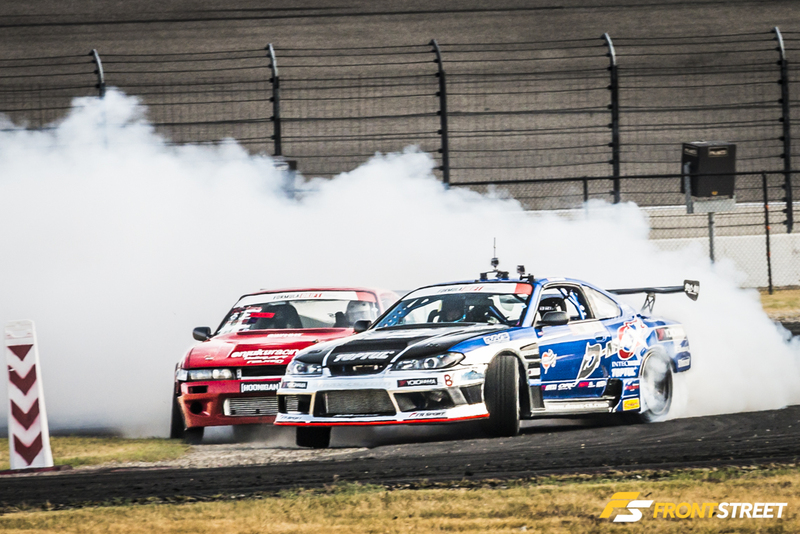 The continuation of the OMT calls started with the Top 16 meeting between Masashi Yokoi in the D-Max S15 Silvia, and “Mad Mike”. 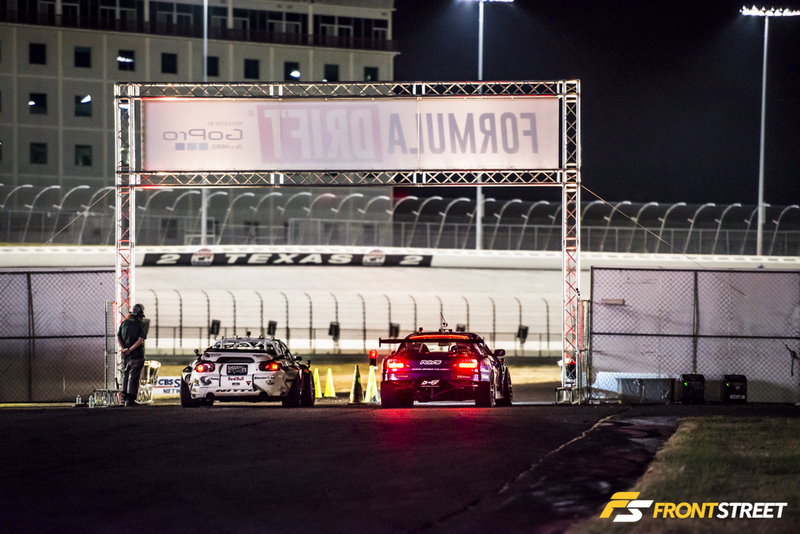 The wall decided the winner, as it claimed the MADBUL as its second victim of the night. 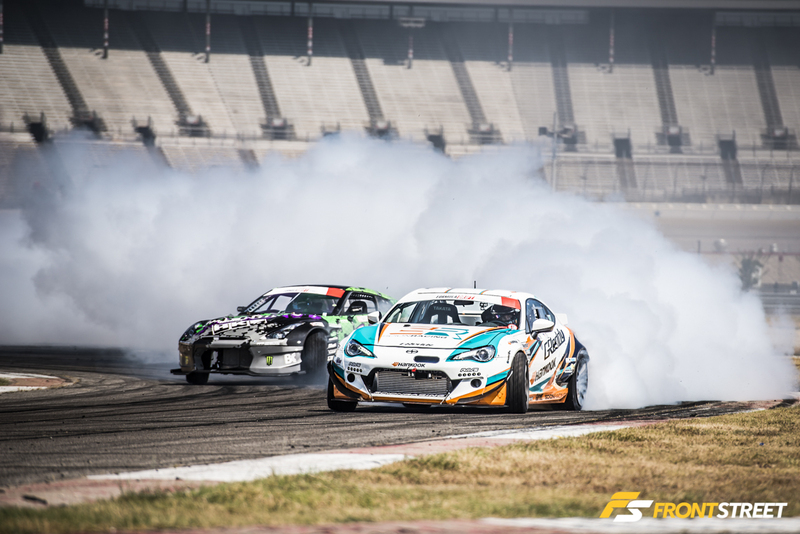 Almost every pairing had a OMT ruling throughout this round, which saw some of the championship’s top names pitted against another. 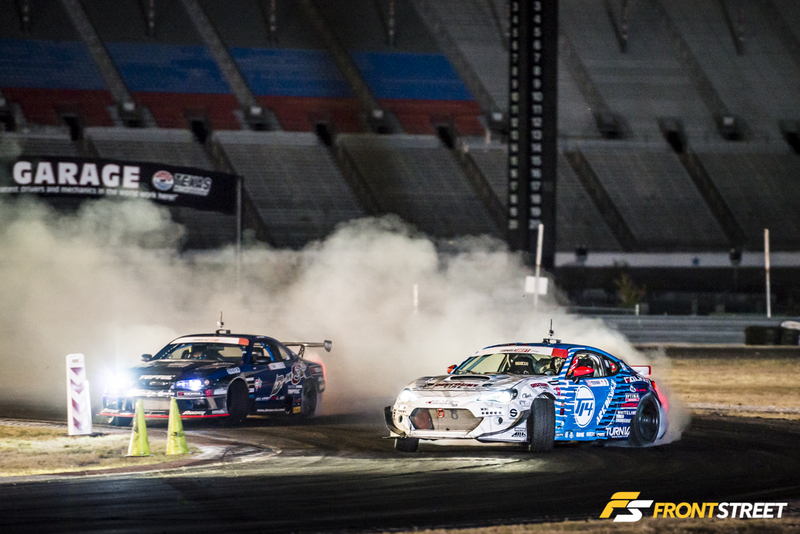 The final runs of the night had Ken Gushi in close battles with a determined Daigo Saito. 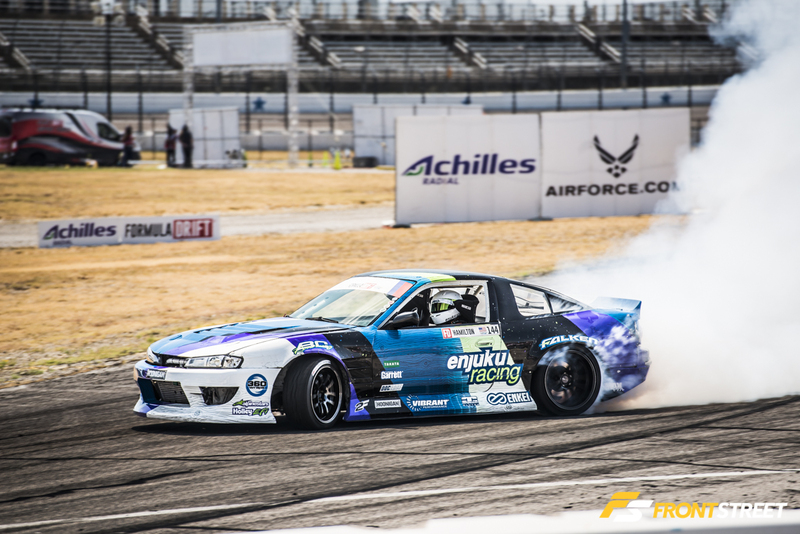 This replayed numerous times due to OMT rulings from the judges, with Gushi eventually progressing to the finals. 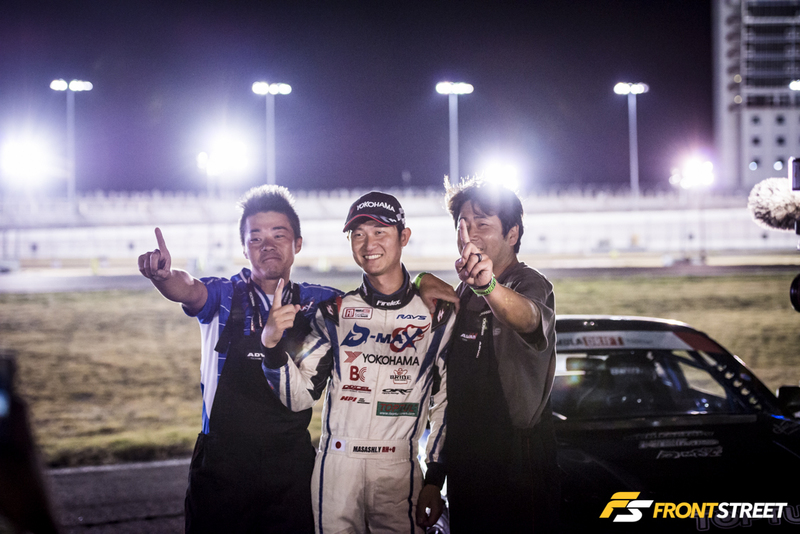 In one night, Gushi’s Scion FRS had endured more tandem runs than his opponent Yokoi’s S15, but managed to push through the last runs of the night without mechanical issues. 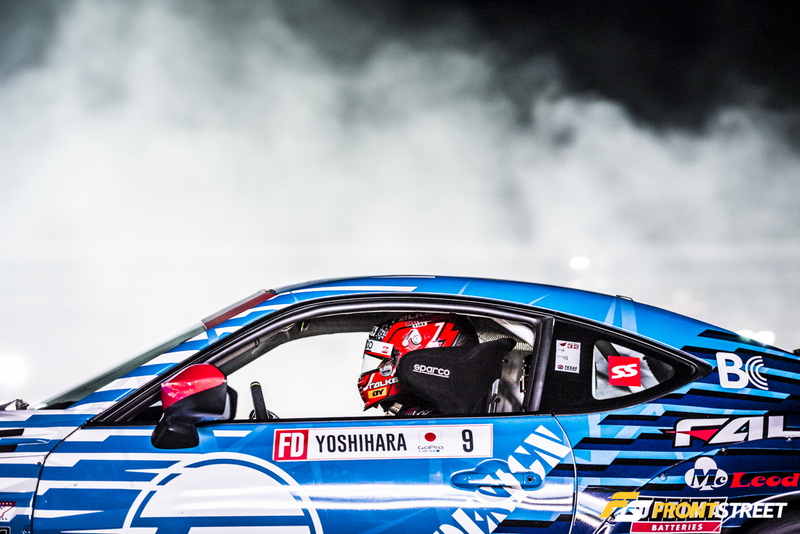 In the end, the FormulaDrift rookie edged out the veteran for a 1st place announcement that caught all attendees by surprise, including Yokoi. 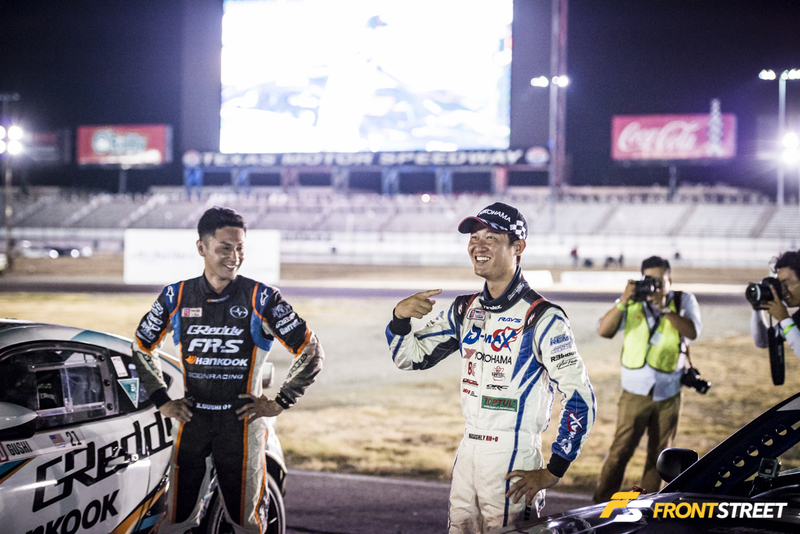 With his win in Texas, and a solid showing at each stop so far, Masashi Yokoi has crept into 6th place in the standings. 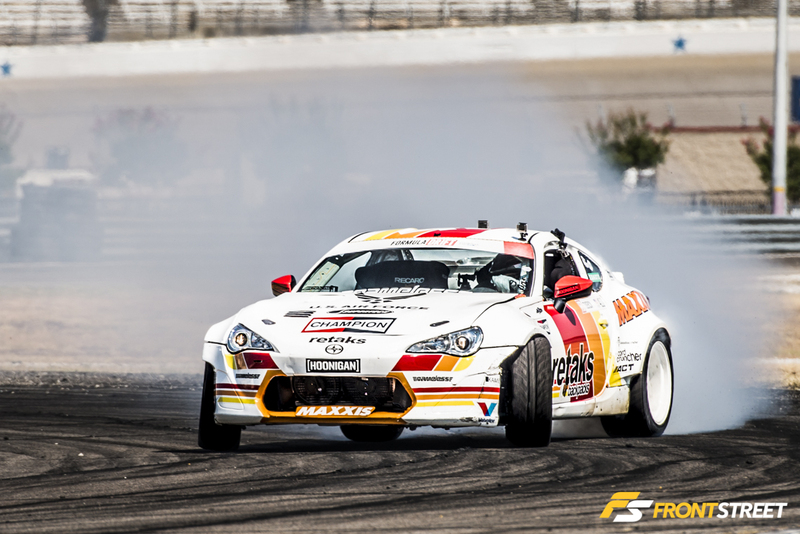 He’ll be looking to better his standings in the final stop of the championship at Irwindale Speedway in October.